Season’s Greetings, to one and all! Fine, it’s not quite Christmas yet, but our little island is already adorned with gorgeous decorations, especially along Orchard Road. Bonus confession: we feel a certain kinship to the admittedly over-the-top ballerina-on-a-music-box theme in Bugis; our waists are likely to end up the size of the skirt by the time we’re done indulging in holiday eats. What’s on our list, you ask? Scroll right on for our selection of festive menus and Christmassy dishes to scoff down this year. Winner of the ‘best Halal spot’ Diners’ Choice award last year, Carousel is definitely a fan favourite. With separate buffet menus for both Christmas Eve and Day, they’ll be injecting their usual array of international eats with a bit of seasonal charm in the form of festive classics like turkey and roasted veg. All this from $68++ onwards! Must-tries: Christmas Roasted Turkey-Japanese Garlic Butter Style (Eve) and Lamb Shank, Roasted Parsnips and Garlic Confit. Yum! You’ve heard of bar and cafe hopping, now prepare yourself for buffet hopping – all in one place. Colony – one of the best eats around, in our humble opinion – has prepared a whopping 5 buffet options! There’s a festive seafood dinner, festive lunch, festive dinner, festive afternoon tea, and even a festive champagne brunch. (The word ‘festive’ is starting to sound weird…) Prices start from $58++, so get your time management skills ready for some serious “festing”! Must tries: Oyster basket, Tarragon Roasted Halibut, Hazelnut and Lemon Mousseline (Christmas Eve Champagne Brunch), and Slow Cooked Scallop, Carrot Puree, Deep Fried Dry Scallop Floss. Our love for Christmas turkey is rivalled by our love for laksa, which is why we’re shamelessly including Atrium for their easy mix of East and West. 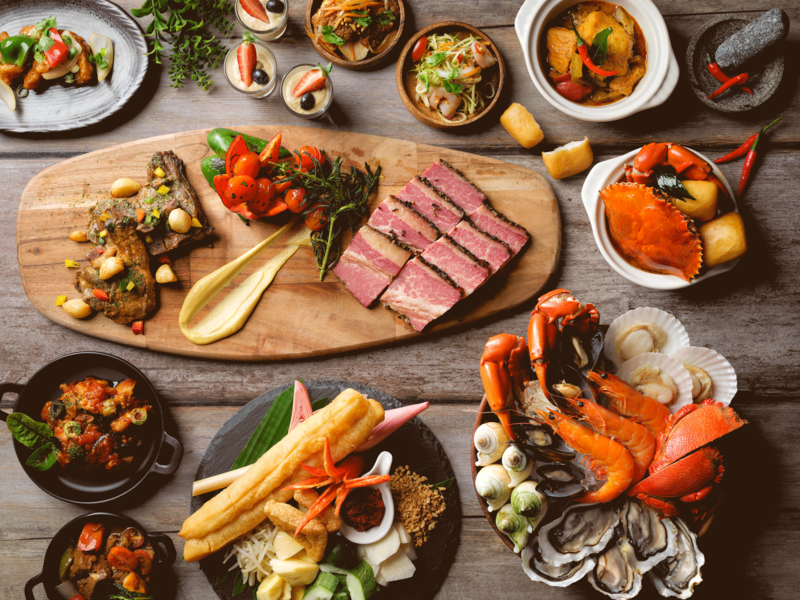 Squeeze in their Festive Offerings buffet dinner ($68++ onwards) for the best of both worlds – a paradise which includes snow crab legs and more. Be sure to grab vouchers from The Chope Shop as well! Book a table at Atrium and earn 2X Chope-Dollars with code TASTYBLOG. Book a table at Chihuly Lounge and earn 2X Chope-Dollars with code TASTYBLOG. There’s no way we could talk about buffets without mentioning Edge. If you’re looking for over-the-top and over-the-edge (#abitsorry), you’ll find it right here at Pan Pacific Hotel. There are festive lunch and dinner buffets available in both November and December, which is packed with luxuries like Boston lobster, wagyu, and suckling pig. Yeah, we’ve given up on calorie counting at this point. At $58++ per person, this buffet is a steal. Find out more here. Unlisted’s Audace welcomes diners with their festive 7 course Degustation Menu ($168++) created by Chef Jérémy Gillon. No stranger to unique flavours from his stints in Michelin-starred locales, his menu boasts interesting – or, should we say, audacious – flavours like Pan Seared Foie Gras with Kumquat crumble and Asperule Odorante (a.k.a. sweet-scented bedstraw a.k.a. an edible plant; yes, we had to look it up too), so you’re sure to have a most joyous meal. Book a table at Audace and earn 2X Chope-Dollars with code TASTYBLOG. If we had a first-world gripe about buffets, it would probably be the homogeneity of their offerings. For something a little more different, NOX’s premium, prix fixe Christmas set mystery is a good place to start. Eat your way through 12 mystery dishes without your sense of sight, and immerse yourself in an unforgettable festive food adventure. Diners with special restrictions may inform the staff/guide and the restaurant will tailor your menu accordingly. Repeat these instructions at the table to the staff/guide before eating, just in case. Book a table at NOX and earn 2X Chope-Dollars with code TASTYBLOG. This family-run “House of Truffles” is getting into the holiday spirit with special festive sets for both lunch and dinner on Christmas Eve and Christmas Day! Featuring extravagant choices like Pan-fried Scallops with Caviar and Black Truffles, you just know that you’re in for a treat at Casa Tartufo. Obviously, truffles are the main choice of ingredient here, so truffle-fans listen up: get ready to go wild with a smorgasbord of truffle-related goodies on the menu. Book a table at Casa and earn 2X Chope-Dollars with code TASTYBLOG. Celebrate this year’s holiday season in exquisite, fine-dining style, complete with gorgeous views of Singapore’s skyline. Perfect for that romantic date, Forlino is a staple when it comes to Italian excellence and awe-inspiring panoramas. The festive menus at Forlino are a delicious mix of traditional and modern Italy, made with prime produce from around the globe. You know what they say, the best way to a person’s heart is through their stomach! Book a table at Forlino and earn 2X Chope-Dollars with code TASTYBLOG. We doubt your mind automatically goes to Asian fare when it comes to holiday feasting, but why shouldn’t it? December is a month for festivities with friends, family, and loved ones, after all, and that includes indulging in a fabulous, well thought out meal. At Hashida, Chef “Hatch” Hashida and team carefully craft an intense gastronomic experience, featuring the prized ise-ebi and golden ikura, promising you a splendid Japanese spread. A smashing way to welcome the new year, we think. Book a table at Hashida and earn 2X Chope-Dollars with code TASTYBLOG. Since we’re on Asian eats, here’s another Japanese restaurant to add to your list! Kinki is an edgy dining concept at Customs House that delivers some of the best Japanese-style bar bites (and sake) we have ever tasted. Hands-down, this is the place to be if you want to party with sushi! And guess what? They’ve got festive eats too! Book a table at Kinki and earn 2X Chope-Dollars with code TASTYBLOG. Finally, if you’re looking to celebrate a warm and snug Christmas from home, you can order the Christmas Festive Hamper that’s available from Song of India. Nobody doubts the merits of a festive home cooking, but the clean-up is definitely no celebration. So grab the order form here and sign yourself up for a night of easy feasting. Get the Tandoori Turkey! Book a table at Song of India and earn 2X Chope-Dollars with code TASTYBLOG. And that’s 12 eats for 12 days! Yum! Whether you’re stuffing yourself with awesome buffet deals or treating yourself to an elegant degustation course, know that we’re wishing you a Merry Christmas. Here’s to a great end to a great year! Cheers!